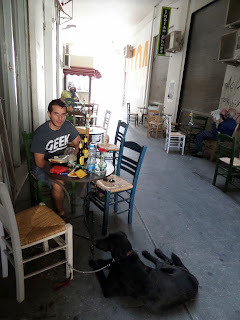 Last Sunday we took a midday break from the Pet Festival and went to find a dog-friendly cafe/bar for a rest. I realise it might not be to everyone's taste, but I really like the little street cafe 'Kafeneio To Kati Tis' ('a little something'). This cafe is tucked away in a stoa (arcade) just off the main pedestrian shopping street, Ledras, towards the border crossing. It reminds me of some of the bars and cafes of Exarchia in Athens, with graffiti on the walls, kafeneio style tables and chairs, and interesting music playing. Kafeneio To Kati Tis seems to attract a good mix of people; this time I saw a group of students, a few couples of all ages, and an elderly gentleman drinking coffee and reading the Sunday papers. I asked the woman serving if it was ok for us to have our dog Sage with us, and she gave a very warm response, and made us feel very welcome. 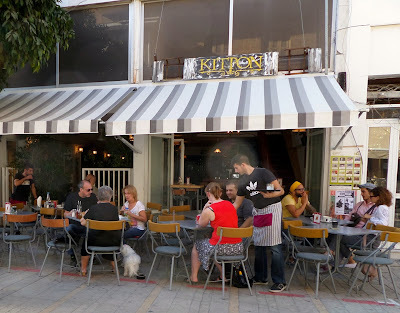 This cafe mainly serves snacks such as pitta with halloumi and lountza, and the plate of mixed appetisers to nibble with drinks (poikilia). 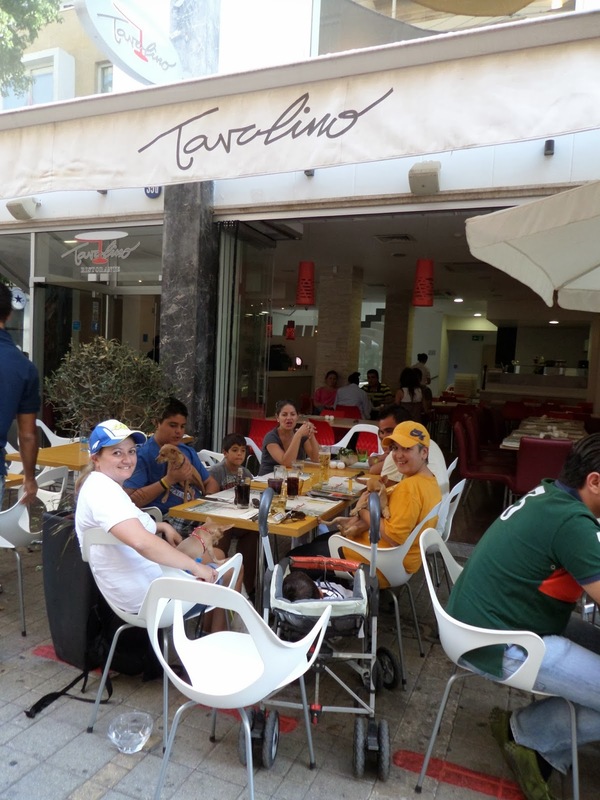 Monday-Friday lunchtimes they serve a small number of traditional homemade dishes. During the winter they use outdoor heaters, and I have sat here even in February, although I did have to keep my coat on. Still, it's a useful refuge from the busier Nicosia streets, summer and winter, for you and your dog. 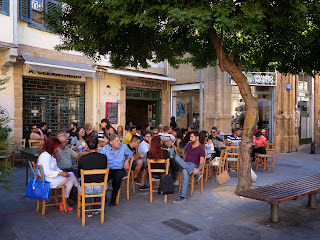 On a previous trip to Nicosia with Sage, I have also been to one of the small cafe-bars in Faneromeni Square. There are several bars here, facing the beautiful 19th century Faneromeni church. 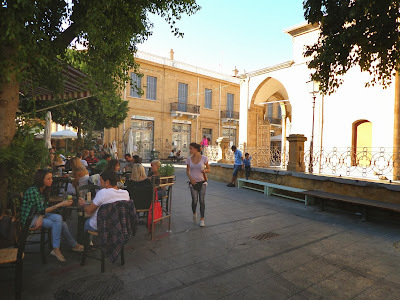 I sat with Sage at the outdoor tables at Chalara (translates as something like: take it easy). Again, this cafe-bar has something of a 'studenty' feel, although people of a wide range of ages and styles frequent this place. 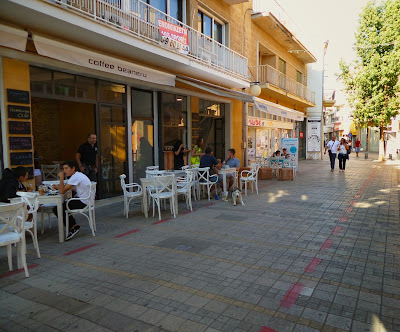 I may be wrong, but I haven't found as many small squares (plateias) in Cyprus as there seem to be around Greece, and I quite miss this feature. 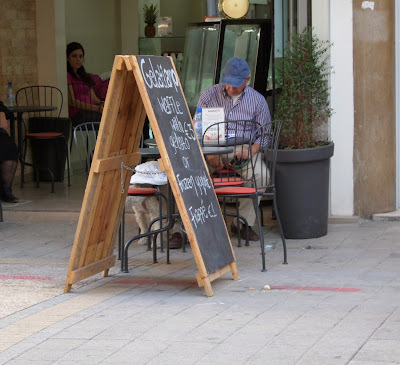 I love to discover small, hidden away squares to escape the main roads of a city, to sit in a street cafe, hearing the bustle and noise of neighbouring cafes, and watch people going about their lives. Faneromeni is great for this. This photo was taken on the day of the Pet Festival; you can just about make out a small white dog, by the tree, enjoying a cafe life in Nicosia. Continuing on our way, back to the Pet Festival, we passed a number of cafes, bars and restaurants, and it seemed like dogs had taken over the city for the day (in a good way). 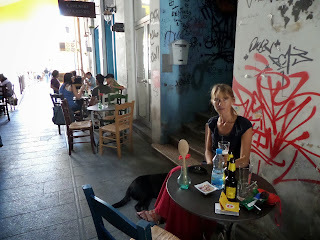 In each place I saw individuals, groups of friends, families, couples, out drinking and eating with their dogs. It was a lovely sunny day, so everyone was sitting outside. I am not sure how many places would welcome dogs inside on colder days, but I'll update this post when I find wintery dog-friendly cafes and restaurants. 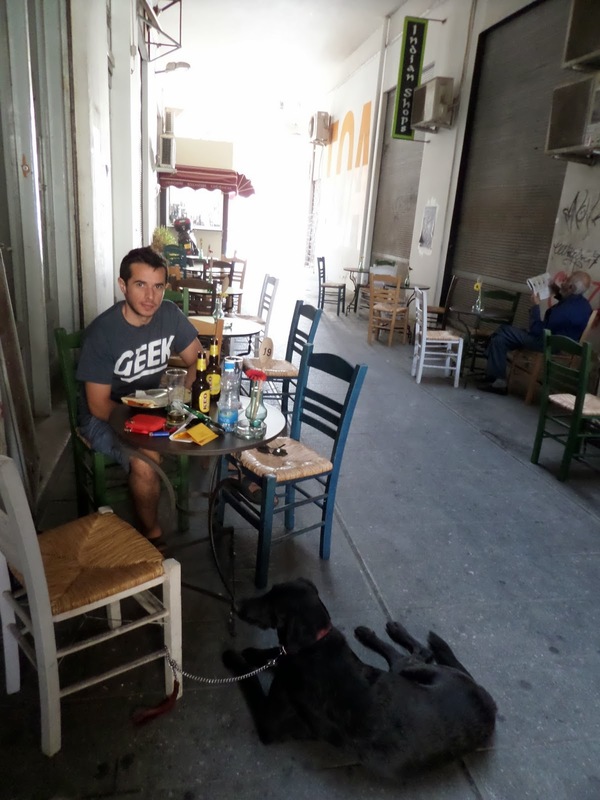 We walked up Onasagorou Street (parallel to Ledras), dog spotting. I'm going to have to visit all these places to find out if they have official policies on pets, if they have any restrictions, if pets are allowed in any of the inside areas etc (in the name of research, of course, not because I want to try the ice-cream...). 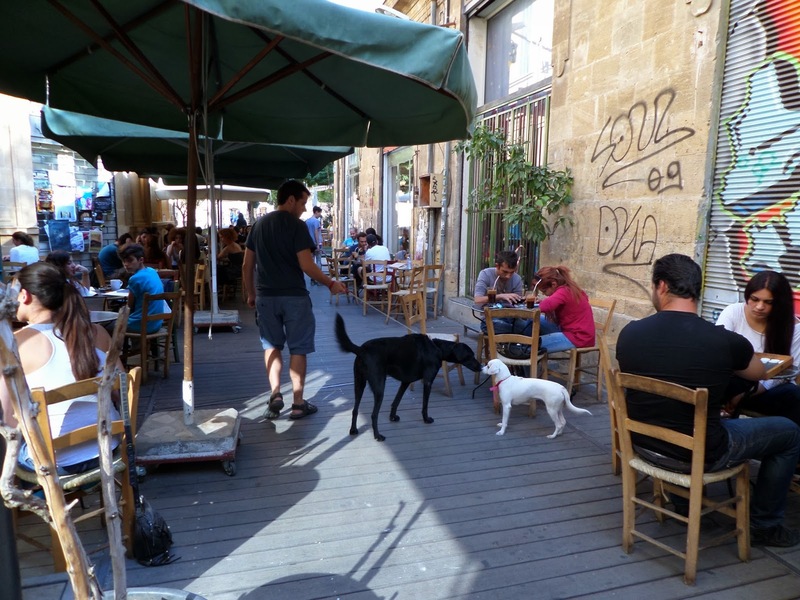 But Nicosia certainly seemed to be a dog-friendly city last Sunday.